"41MR12, Burial I, 75" by Timothy K. Perttula and Robert Z. Selden Jr.
DECORATION: The rim has four sets of hooked arm scrolls repeated around the vessel, and each of the two sets of hooked arms abut each other. Above and below the scrolls are hatched engraved zones. 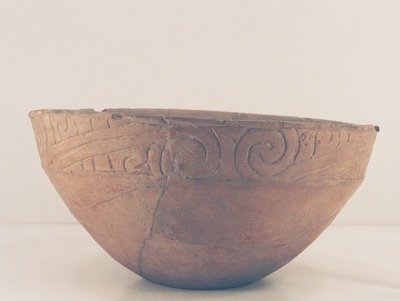 Taylor Engraved carinated bowl (MR12-75) from Burial I at the Ben McKinney site.